6922 L/Cpl J Webb, wife of Meadowfield, Frogwell, Chippenham. Killed in action. Pte Britten who is a native of Derry Hill, Chippenham writes: "I knew that L/Cpl that you mentioned in your letter, but I am sorry to break the news to you that the poor chap got killed at Cambrai on Wednesday 26th August. He was killed by a shell from the Germans about 8.30am. The one you spoke about had a locket around his neck and had two photos in it; so you can see that I knew him, he used to work in the foundry. We went into action about 3 o’clock in the morning and the Germans very nearly surrounded us, so you can see we were in a tight corner. As I was crawling along I noticed him and he was hit in the head, poor chap. I should have taken the locket off only I had no chance as the Germans were on top of us. We only lost about 10 at Mons, that was in one trench, although we were shelled all the time by them devils." The writer adds that he and L/Cpl Webb went to Belgium together. 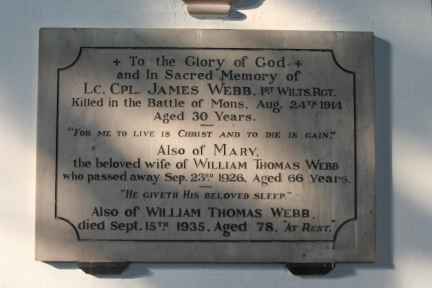 Britten says that Webb was killed on the 26th August at Cambrai. Yet his widows in memory notice says the 24 August at Mons. Also casualty list is dated 26 August, Britten appears to have his dates wrong. In loving memory of My dear husband L/Cpl James Webb. 1st Wiltshires who fell in the battle of Mons, August 24th 1914. Ever remembered by his Wife and darling Child. Could we have raised his dying head. And heard his last farewell. To those who loved him so well. Also remembered by his loving Father, Mother, Sisters and Brothers. In loving memory of L/Cpl Webb who was killed in action in the battle of Mons August 24th 1914. In a grave I may never see. Every remembered by his loving Sisters, Mary and Edith also by Father and Mother. 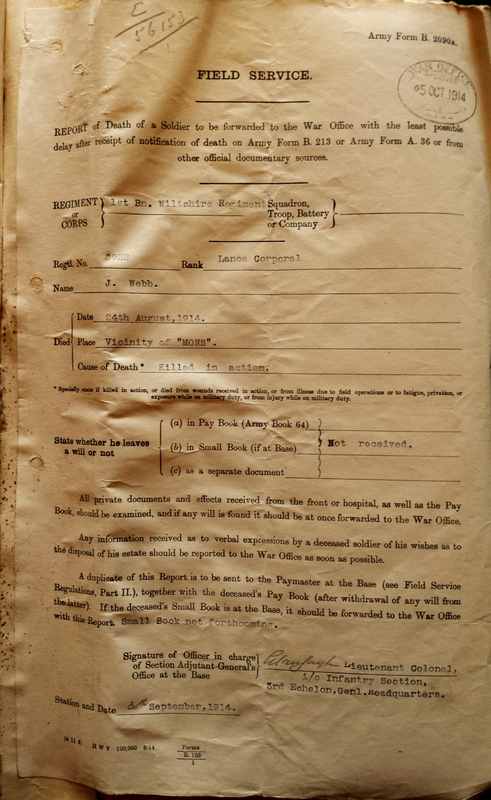 There was no record of a 6922 L/Cpl James Webb being killed during the war by the CWGC. I submitted his name to them after obtaining a copy of his death certificate which clearly showed him as being killed by enemy action along transcripts of the newspaper articles. 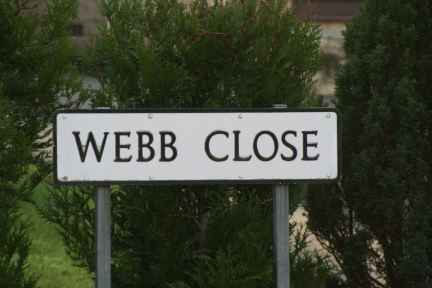 On 13 May 2008, the CWGC agreed that Webb was a war casualty and they now record his name. Obviously after almost 94 years, there is no record of his burial location so he is commemorated on the La Ferte-Sous-Jouarre Memorial.